ISO XP is a premium-quality whey protein isolate which is packed with probiotics, amino acids, and wholesome nutrition. Made with all-natural grass-fed New Zealand whey, ISO XP offers superior protein supplementation to assist with muscle growth, fat loss, hormone regulation, and cellular health. Studies have shown that whey isolate shakes are a healthy, easy-to-digest way for people of all ages to boost their protein intake. XP Labs has designed ISO XP to deliver not only the best in sports nutrition, but a formula which can benefit anyone – athletes, bodybuilders, seniors, hikers, weekend gym-goers, and more. No matter what your reason, ISO XP is here to guide you towards your Xtreme Performance goals. ISO XP is the preferred brand of many athletes, nutritionists, trainers, and fitness enthusiasts. Why not make it your favorite brand as well? ISO XP is made using cold-processed New Zealand whey isolate, which guarantees you will be getting the most naturally wholesome whey supplement possible. In addition, XP Labs uses Lactospore probiotics to bolster your immune system and digestive health. And to enhance the creamy, ice-cream-like flavor, a touch of Stevia has been added for sweetness and depth. ISO XP is optimized to support you no matter what your goals are. The high concentration of protein, amino acids, and probiotics per scoop is the perfect combination for muscular growth, weight management, and general health supplementation. ISO XP is even a great choice for seniors looking to combat age-related muscle loss. There is no better protein out there! ISO XP is guaranteed to be free of rBGH, or Recombinant Bovine Growth Hormone. There are also no GMOs, no antibiotics, and no other undesirable chemicals. ISO XP is nothing but natural, healthy ingredients. ISO XP is the protein supplement of choice for people in all stages of fitness, from beginners to lifetime professionals. See how the XP Labs Xtreme Performance experience and ISO XP have made an impact with them! Love this protein! Can’t believe the quality of the protein for the price! Had used this for awhile and highly recommend to others! Amazing flavour! I love this protein powder flavour. I literally put it in everything – oatmeal, greek yogurt, cottage cheese – not just in protein shakes. Whey protein has been used by athletes for years to help build muscle, and as a result, it has been studied extensively by scientists. This has made it famous for all of its amazing qualities, from muscular support to fat burning and overall whole-body wellness. There are many benefits of whey protein, including its ability to increase strength, build muscles, burn fat and so much more. Whey protein increases cellular glutathione which in turn improves the free-radical fighting ability of your body. This should improve muscle recovery and overall health. The researchers reported that the men consuming whey protein isolate supplementation saw improved muscle strength in the days following the muscle damage. The whey protein group also had less markers of muscle damage, which may be due to the potent antioxidant abilities of whey protein. Whether you are looking to perfect your physique or just wanting a bit of protein supplementation, ISO XP has a fantastic lineup of benefits for your body. Why choose New Zealand grass-fed whey? All dairy from New Zealand comes from free-roaming cows, who enjoy lush pastures and a natural, healthy environment. There are no antibiotics or hormone injections, and the cows never spend time in a smelly feedlot. The end product is pure, delicious dairy from healthier and happier cows. And because the milk they produce is some of the best in the world, everything made from that milk is also going to be premium quality. In other words: Start with the best, end with the best. That’s why XP Labs has chosen New Zealand grass-fed whey and That’s why you should, too. Because the standards for New Zealand dairy are so high, you can rest assured that there has never been any GMO exposure in ISO XP whey. XP Labs has gone to great lengths to ensure the absence of GMOs in ISO XP so that you, the consumer, can be sure to have the most natural and wholesome product possible. Stevia was chosen as a sweetener to enrich the ice-cream-like flavor of New Zealand whey without adding any sugars. Stevia does not have any impact on blood sugar levels and, as a result, is considered to be safe for diabetics and anyone else who may need to monitor their blood sugar regulation. ISO XP is safe for use by anyone who is gluten intolerant or otherwise has gluten sensitivities. Additionally, ISO XP is nearly 100% lactose-free, making it usable by almost all lactose intolerant people. XP Labs is dedicated to providing products which meet the needs of a wide range of users, and those who cannot consume gluten or lactose have not been forgotten! 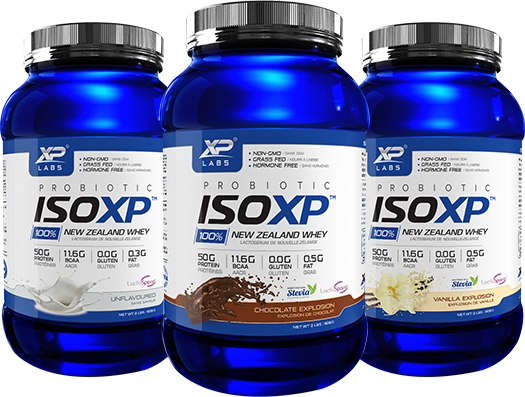 XP Labs has added probiotics to ISO XP in order to elevate the digestive benefits already present in whey. Probiotics help keep your digestive tract full of friendly bacteria, which promotes good whole-body health. The probiotics in ISO XP aid your metabolism and bolster your immune system to keep you going strong each day. How do I use ISO XP? Experts recommend 1 to 3 servings of whey protein each day for optimal results. One serving should be taken immediately following a workout, while the other two can be consumed in the morning and evening. Preparing ISO XP is as easy as adding one heaping scoop to your beverage of choice – we recommend milk or water – and mixing well. You can also add ISO XP to several recipes and food items, such as oatmeal, pancake mix, or yogurt. Is grass fed protein powder better? The New Zealand grass-fed whey in ISO XP is a cleaner, more natural choice for your protein needs in comparison to other protein powders. Why? The answer stems from the strict laws governing all of New Zealand’s dairy products. Not only are the cows producing the whey healthier and happier, but the whey itself is completely free of antibiotics, hormones, and other harmful chemicals. Is whey protein isolate good for weight loss? Yes, studies have indicated that whey is not only a top quality choice for keeping yourself satisfied throughout the day, but it can aid in your weight loss journey by activating your body’s natural powers of thermogenesis! Does whey protein isolate have lactose? ISO XP is approximately 99% lactose free. The lactose content is so low that most lactose intolerant people will have absolutely no problem enjoying the rich, creamy taste of whey. It can even be used as a substitute for milk in your cereal bowl! Are there any side effects of taking ISO XP? There are no known side effects of consuming whey. Whey protein is a safe, wholesome protein supplement made from dairy products. As always, read the label carefully and do not use ISO XP if you are allergic to any of the ingredients. How does ISO XP taste? ISO XP has a delicious ice-cream-like flavor that is naturally sweet and velvety. Currently, it is offered in either a chocolate or a vanilla flavor. ISO XP is backed by science, formulated by leading experts in sports nutrition, and is the choice of champion athletes. If you want to lose weight, build muscle, and feel healthier, then make the educated choice – choose ISO XP today. Natures Harvest Health Food Store has announced that they are now an authorized XP Labs dealer. The store, whose headquarters are located in North Bay, Ontario, Canada, recently announced that they will now be offering their customers products from XP Labs. XP Labs provides ISO XP, which is a high quality whey protein isolate. Hotte explains that the supplement is filled with amino acids, probiotics and wholesome nutrition and made from grass fed all natural New Zealand whey. The supplement provides protein supplementation that is designed to help with muscle growth, hormone regulation, fat loss and cellular health. Hotte says that the supplement from XP Labs will go nicely with the Natures Harvest health food supplements that the company already offers. He states that it is the perfect choice for those who are looking to get the best sports nutrition, such as bodybuilders and athletes. Hotte stays that the protein supplement is also good for senior citizens who may not be getting enough protein in their daily diets, as well as hikers and those who workout on a daily basis. Protein is essential in helping to build muscle and avoid losing muscle when working out. Hotte says that the supplement is good for helping those working out to avoid losing the muscle that they are trying to build. ISO XP is a popular nutritional supplement among professional athletes as well as dietitians and nutritionists, coaches and trainers and other fitness enthusiasts. Hotte says that the brand itself is synonymous with high quality and states that the protein supplement is made from only the highest quality of ingredients. He says that the process of creating the supplement includes cold processing whey isolate so users know that they are getting the most natural whey supplement possible. He states that the manufacturer of the supplement uses Lactospore probiotics to boost digestive health and the immune system, making the supplement a good choice for anyone who suffers from regular digestive issues or who cannot generally take whey or protein supplements because of digestive issues. The whey supplement is designed to support the entire body with amino acids and high concentrations of protein. Hotte says that added to that is the creamy smooth flavour of ISO XP and it’s also a great choice for anyone who is looking to lose weight, build muscle or generally supplement their protein intake on a daily basis. Hotte says that the product is also free from GMOs and hormones, making it safer than other similar items on the market. This is one of the reasons that the company chose to work with the supplement manufacturer XP Labs. Hotte says that they want to provide their customers with products that help them to get the bodies that they want, but only in the safest possible way. The supplement does not contain rBGH, a growth hormone, and Hotte says that there is nothing unnatural in the supplement at all, which is the main reason that the company chose to feature it. Natures Harvest Health Food Store states that they are all pleased to now be considered an authorized seller of products from XP Labs. They state that their protein supplement is just the first of many products that they plan to offer from the manufacturer in the future. Natures Harvest Health Food Store offers only quality and natural products for their customers, many of which are designed to help with workouts, supplementation and other health related issues. The company states that their goal is to be a one stop shop for customers on their quest to a healthier lifestyle. They currently offer a number of health supplements and other similar products that are designed to help customers with working out, building muscle, losing weight and other healthy lifestyle related topics.